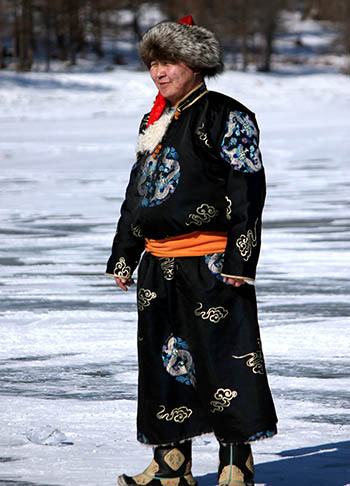 The iconic garment worn by nomads in Mongolia is undoubtedly the del. This is a kind of large coat that crosses in front to attach to the side and on the shoulder with buttons. Traditional buttons are rounded nodes made of a thin cord, but they are sometimes replaced by buttons of another material. The del is worn both by men and by women, women prefering silkier material and blue, green, pink colors... The fabric is often enhanced with traditional Mongolian geometric designs. There are winter dels, lined with fur, particularly warm. A trip to Mongolia in the period of Tsagaan Sar, in February, lets see the Mongolians dressed in their finest del in honor of the Mongolian New Year. A colorful journey! The cross sections of the mantle on his stomach and chest, supported by the belt, form a kind of large pocket in which the nomads slide cigarettes and other items! The belt that is worn on the deel is usually made of a long strip of cloth wound several times around the waist. For men, its length is 3 or 5 meters (an odd number), while for women is actually 2 or 4 meters (an even number). Men generally choose the yellow or orange color, women yellow or green, but all fantasies are allowed. In times of celebration, this cloth belt is replaced by a leather belt with a big and very elaborate silver buckle. The hat is an essential element of the Mongolian clothing: a Mongol nomad almost never comes out bareheaded, he always wears something to cover his head, even if it's just a cap! Of course, extreme weather conditions dictate their constraints, and if this headgear is used to protect against the burning sun of summer, especially in the Gobi Desert, the winter gives way to fur hats to withstand the often reached - 30 ° C! The boots are essential for any rider, and the Mongols are no exception. Traditional boots are often made of leather with the toe curled upward. Some have a device that enables a part of the boot to come off if the foot would remain stuck in the stirrup, one of the obsessions of Mongolian horsemen. In winter, there are large felt boots, which have both the advantage of keeping warm and not to slip on the ice.